Pelletier's Powder Coating is pleased to offer a new service - a specialized application of our soda blasting process specifically for removing graffiti. We can now come to your site and restore your site to its original condition quickly and with no harm to the surface. 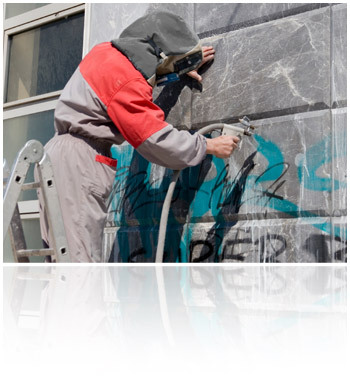 Soda blasting is perfectly suited for graffiti removal because it's environmentally friendly and gentle on the substrate. There's no toxic residue, no damage to your site surface, and it's very effective. Read more about the benefits and applications of soda blasting. Please contact us to learn more about how our graffiti removal service can work for you, or schedule a cleaning appointment.